← How to explain the principle of inclusion-exclusion? Picture this! 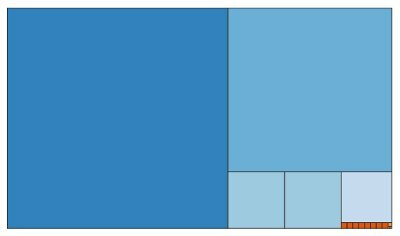 is a very cool interactive thingy, made by Jason Davies, intended to get students (or anyone, really) thinking about some interesting math. Go play around with it and see if you can answer any of the listed questions (or any other questions you might come up with yourself). It turns out to be quite intimately related to something I’ve written about before—but I won’t spoil it by saying what (at least, not yet =). This entry was posted in challenges, links, pattern, pictures and tagged interactive, picture, rectangles, this. Bookmark the permalink. It seems to be limited to 200, making spirals using, say, 377 and 233 impossible. I discovered this when trying 355 and 113. Yes, it seems you’re right. That is unfortunate. Of course once you get too big you can’t really see the smallest squares. So is 239/169, in a different way. I had hopes for 1264/465, but it got too small too fast. It looked better cut down to 799/465. There’s good math there for K-16.